Imagine how business will be like if a mental picture of your company pops up when a potential customer thinks of your industry! This will draw customers to you instead of you working hard to get to them. But how do you achieve this? How do you own ‘mental real estate’ in the minds of your customers? How do you own the words that are the solutions to the customers’ needs and fears? ONLY TAKE BLUE BIRD TAXI! So what’s their secret sauce? 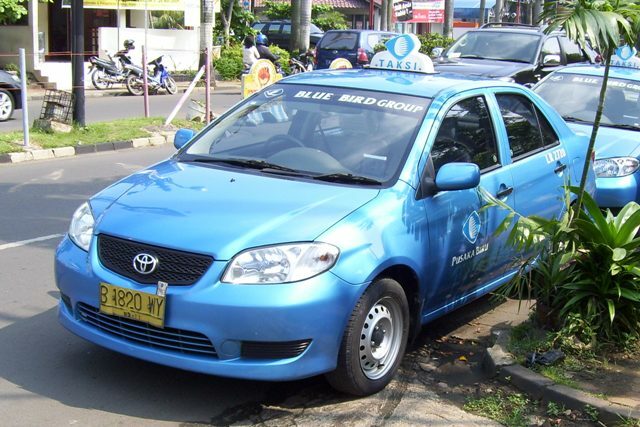 This is because Blue Bird taxi owns the words in any foreign travelers to Indonesia’s mind – Safety and Honesty: The two things that matter most to business or holiday travelers. At the airport taxi stand, I did not even consider heading towards any other taxi companies even though I had to wait for a Blue Bird taxi. I know I won’t have to put up with faulty meters and roundabouts to charge a higher fare. This brings to mind that whenever I travel to Vietnam for business, I only take Vinasun Taxi. The only time I tried my luck to take a non-Vinasun taxi, the driver tried to rip me off. Fortunately, I travel to Vietnam a lot, so i called his bluff. That experience only reinforces the belief – only take Vinasun taxi in Vietnam. Again, this taxi company, like Blue Bird, owns the words Safety and Honesty in the minds of the traveler. Whenever I touch down in Vietnam’s airport, its straight to the Vinasun counter. All the other taxi counters and sales representatives are a blur to me. I make a single-minded, focused, beeline to the Vinasun counter. Owning the words Safety and Honesty really works doesn’t it? They don’t need taxi touts to bring you to the taxi – you walk there on your own, ignoring and forsaking all others. Wouldn’t you want a customer to make a single-minded beeline towards your office today? Would you like to be like Volvo, who owns the words Safety in the minds of car buyers? Just ask anyone who had a near death car accident what car they would buy. Or BMW, who owns Driving Experience? All these companies know who they are selling to, and why. That’s why they developed a strategy to OWN these words in the minds of car buyers. is this about branding? Maybe? But it goes deeper than that. It goes into knowing your WHO – the core customer whose needs and fears you can meet, and who will pay you optimally for that. It is about them buying from them even before they start the process of shopping because they already know it is you. Because they already feel assured before they even hand over the cash. If you can capture certain words in the mind of your customer, you win the game even before it starts. Business is all about psychology and emotions. Like Sun Tzu says, you have to win the war even before it starts. Even before the battle of the taxi touts start, Blue Bird and Vinasun has already won. Is your business owning a few important words in the industry that make customers head straight to you with no distractions? Would you like to know how to? In Gazelles, we teach you how.